Everyone’s beloved favorite Dr. Seuss stories are the basis for Musselman High’s production of Seussical, a Theatre for Young Audiences show. Adults love it as much as kids. It’s on this weekend, Oct. 21 – 23 and you can read the details at www.musselmantheatre.com. On Saturday, October 22 you can enjoy dinner and the show, if you get your tickets in advance! Theatre students have them, or email ahinwood@aol.com. Musselman High is just off Route 11 in Inwood. The production is presented by special arrangement with MTI. This week marks the first sessions of the BAC’s Arts in Education Pilot Program. 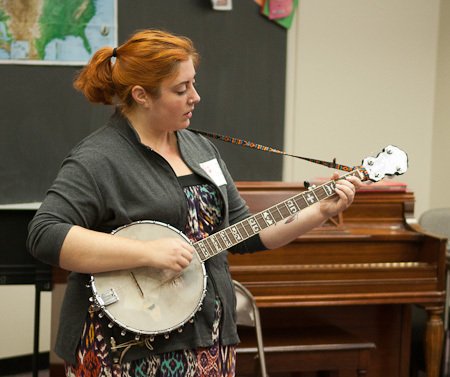 On Friday, at Tomahawk Intermediate, Chelsey McBee will be performing on traditional instruments and teaching about Appalachian Roots music for the fourth graders there. 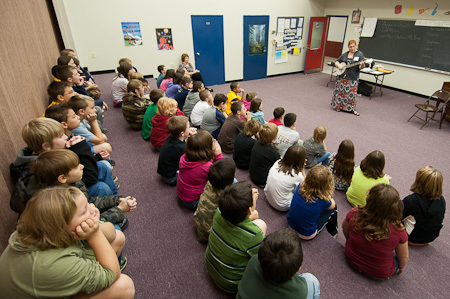 Chelsea leads a discussion with the students at Tomahawk Intermediate School in Hedgesville. This is just one of the areas where there are almost unlimited opportunities to connect arts with our community, and we hope to continue and expand the program. We need artists who can teach; teachers with ideas to enhance their curriculum; and community supporters to provide matching funds that really determine how quickly the program can grow. 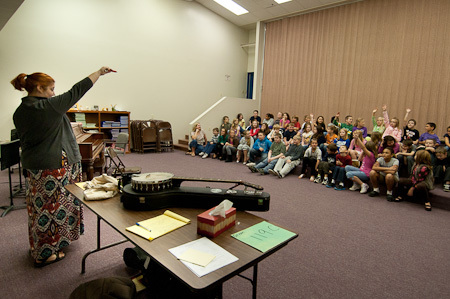 Chelsea explains the African origins of the banjo to the students at Tomahawk Intermediate School. The program is supported by grants from the West Virginia Division of Culture and History’s Commission on the Arts; and from the Eastern West Virginia Community Foundation.